Some Aids for Effective Meditation | Fourth Dimension Inc. The shape of our inborn divinity. Images, words and ideas are some of the powerful aids for meditation. When they are properly used they can lead to the inner experience. 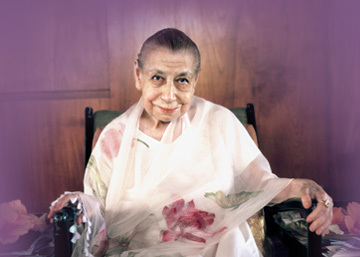 This article is from Mother’s conversations with children of the Ashram school and her answers to questions on this subject. The role of imagination in Meditation; how to meditate on words and ideas. Sweet Mother, when you tell us to meditate on a subject we choose, for instance, to meditate that we are opening to the light; we imagine all sorts of strange things, we imagine a door opening, etc., but this always takes a mental form. It depends on the individual. Everyone has his own particular process. It depends altogether on each one. Some people may have an imagery which helps them; others, on the contrary, have a more abstract mind and only see ideas; others, who live more in sensations or feelings, have rather psychological movements, movements of inner feelings or sensations – it depends on each one. Those who have an active and particularly formative physical mind, see images, but everybody does not experience the same thing. If you ask the person next to you, for instance… (To the next child) When I give a subject, do you see images like that? Most often I feel something. What is it, most often? A sensation, yes. It is more frequently a sensation – I mean generally – more frequently a sensation or a feeling than an image. The image always comes to those who have a formative mental power, an active physical mind. It is an indication that one is active in one’s mental consciousness. (The child who had asked the first question) But is this right?. But everything is right if it has a result! Any means is good. Why shouldn’t it be right?… Images like that are not necessarily ridiculous. They are not ridiculous, they are mental images. If they bring you some result, they are quite appropriate. If they give you an experience, they are appropriate. For example, when I ask you to go deep down within yourselves, some of you will concentrate on a sensation, but others may just as well have the impression of going down into a deep well, and they clearly see the picture of steps going down into a dark and deep well, and they go down farther and farther, deeper and deeper, and sometimes reach precisely a door; they sit down before the door with the will to enter, and sometimes the door opens, and then they go in and see a kind of hall or a room or a cave or something, and from there, if they go on they may come to another door and again stop, and with an effort the door opens and they go farther. And if this is done with enough persistence and one can continue the experience, there comes a time when one finds oneself in front of a door which has – a special kind of solidity or solemnity, and with a great effort of concentration the door opens and one suddenly enters a hall of clarity, of light; and then, one has the experience, you see, of contact with one’s soul…. But I don’t see what is bad in having images! No, but it is only an imagination, isn’t it, Mother? An imagination? But what is an imagination?… You cannot imagine anything which doesn’t exist in the universe! It is impossible to imagine something that doesn’t exist somewhere. The only possibility is that one may not put one’s image in its place: either one gives it virtues and qualities it doesn’t have, or explains it with some other than the right explanation. But whatever one imagines exists somewhere; the main thing is to know where and to put it in its proper place. Of course, if after having imagined that you are in front of a door which is opening, you thought that it was really a physical door inside your body, that would be a mistake! But if you realise that it is the mental form taken by your effort of concentration, this is quite correct. If you go wandering in the mental world, you will see plenty of forms like that, all kinds of forms, which have no material reality but truly exist in the mental world. You cannot think powerfully of something without your thought taking a form. But if you were to believe that this form was physical, that would obviously be an error, yet it really does exist in the mental world. And of course it happens! Mother, in the Friday Classes, you often read a sentence to us and ask us to meditate on it. But how should we meditate on a sentence? That is, should we think, meditate on the idea or… what should we do? Obviously on what it means. Because that, Mother, becomes a mental function or what? The sentence is already a mental formation; the mental formation is made. The sentence is the expression of the mental formation. So when you meditate on a sentence, there are two methods. There is an active, ordinary external method of reflecting and trying to understand what these words mean, understand intellectually what the sentence means exactly – that is active meditation. You concentrate on these few words and take the thought they express and try, through reasoning, deduction, analysis, to understand what it means. There is another method, more direct and deep; it is to take this mental formation, this combination of words with the thought they represent, and to gather all your energy of attention on it, compelling yourself to concentrate all your strength on that formation. For instance, instead of concentrating all your energies on something you see physically, you take that thought and concentrate all your energies on that thought – in the mind, of course. And then, if you are able to concentrate on the thought sufficiently and stop it from vacillating, you pass quite naturally from the thought expressed by the words to the idea which is behind and which could be expressed in other words, other forms. The characteristic of the idea is the power to clothe itself in many different thoughts. And when you have achieved this, you have already gone much deeper than by merely understanding the words. Naturally, if you continue to concentrate and know how to do it, you can pass from the idea to the luminous force that is behind. Then you enter a much vaster and deeper domain. But that asks for some training. But still, that is the very principle of meditation. If you are able to go deep enough, you find the Principle and the Force behind the idea, and that gives you the power of realisation. This is how those who take meditation as a means of spiritual development are able to unite with the Principle which is behind things and obtain the power to act on these things from above. But even without going so far – that implies a rather hard discipline, doesn’t it, a long – standing habit – you can pass quite easily from the thought to the idea, and that gives you a light and an understanding in the mind which enables you, in your turn, to express the idea in any form. An idea can be expressed in many different forms, in many different thoughts, just as when you come down to a more material level, a thought can be expressed through many different words. Going downwards, towards expression, that is, spoken or written expression, there are many different words and different formulas which may serve to express a thought, but this thought is only one of the forms of thought which can express the idea, the idea behind, and this idea itself, if it is followed deeply, has behind it a principle of spiritual knowledge and power which can then spread and act on the manifestation. When you have a thought you look for words, don’t you, and then you try to arrange these words to express your thought; you can use many words to express a thought, you tell yourself, “No, look, if I put this word instead of that, it would express what I am thinking much better.” That is what you learn when you are taught style, how to write. But when I give you a written sentence which has the power to express a thought and tell you to concentrate on it, then, through this thought-form you can go back to the idea behind, which can be expressed in many different thoughts. It is like a great hierarchy: there is a Principle right at the top, which itself is not the only one, for you can go still higher up; but this Principle can be expressed in ideas, and these ideas can be expressed in a great number of thoughts and this great number of thoughts can make use of many languages and an even greater number of words.